Yesterday, Valerie and I went flea marketing for old albums and I scored big time. 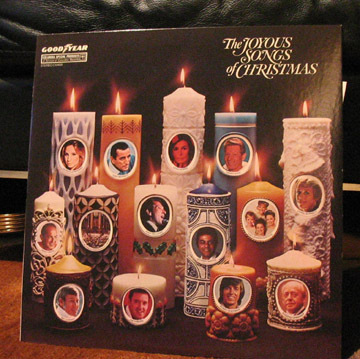 This is my very favorite Christmas album from my childhood and it’s in pristine condition. The one we had when I was a kid had a ton of skips but we always played it anyway. I was so excited by my find that I went home and played it. Not a single pop, hiss or skip! I also love the cover with the candles. On the back is an outline of the candles and information about each singer. Yep, that’s Bobby Sherman you see there, along with Lena Horne, Carol Burnett, Johnny Mathis, Danny Kaye and more. I’m so excited about my find! This is why I love to flea market. You just never know what treasure you’ll unearth. Oh, and all this nostalgic goodness only cost me $1. I also have to include a picture of Littles. It’s so cold here that she’s always searching for a warm spot. 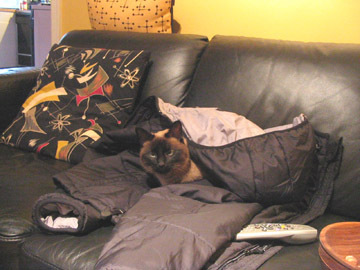 The other day, I threw my coat on the couch after class and she crawled inside for a snooze. She’s such a cutie! Which number is that? Because I have album 5 of that Good Year collection. I snagged it from my parents becuase it was my very favorite Christmas album. It’s a bit older, I’m guessing, but it has classic tunes – both secular and spiritual – from the likes of Andy Williams, Dinah Shore, Danny Kaye, Diahann Carroll, Sammy Davis Jr (singing Christmas music? Must be pre-conversion) and my favorite: Steve Lawrence and Eydie Gorme singing Sleigh Ride – I imagine them with a highball in one hand, a cigarette in the other. This is what says Merry Christmas to me – the sounds of the early 60s. Nothing can compare. I don’t know what number it is because it doesn’t say. I just know we had several of these Goodyear Collections we bought at Montgomery Ward. We also had some of the JC Penney collections. I’ve bought some of the albums for framing, but none are in good enough condition to play. I agree that these albums say Merry Christmas. Even though some of the songs are cheesy, they are from my childhood and really make the holiday special for me. I also have to hear the Kingston Trio Christmas album and the Beach Boys Christmas album each year. Fortunately, I have those on CD so I don’t have to search for the actual LP.